The latest film by Gary Hustwit (Helvetica, Objectified). Good to see he keeps working along the same lines. I found both of his films interesting, at the very least. Hopefully this one is going to be equally good (if not better). The Thirteenth Floor. Existenz. The Matrix. Movies that more or less, in their respective segments, defined a time, set a trend. That was 1999 and while the first two movies became ‘cult’, mostly due to their lower budgets and respective promotion, the latter ended up being a megahit that drew praise from geeks, critics and philosophers alike, before the writers decided to sell out and botched the story and the universe they created with two poor sequels. One basic premise of all of those films was the multi-layered existence of the characters, their ability to ‘live’ in mulitple worlds; usually, for the sake of audience comprehension, those worlds were limited to two: the ‘real’ world and a virtual one. A mechanism for moving between these two ‘worlds’ was presented and it always had to do with technology (technology being an easy way to ‘explain’ the impossible without going into much detail). Christopher Nolan could not have escaped the effect that those movies had, when he first imagined Inception in 2001, just a year after Memento, a film he directed and co-wrote, was met with great acclaim. Originally imagined as a horror film, Nolan decided to film Inception as a heist movie instead and this ended up being one of the most important decisions he could have made. 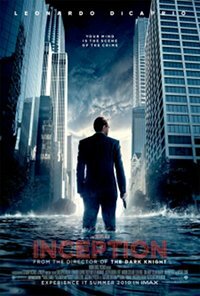 ‘Inception’ is a ‘product’ of that first generation of Hollywood productions involving the multi-level existence of the protagonists, but it goes a step further: it marries a complex concept — that of a thief stealing ideas from people while they are dreaming — with masterfully simplified narration, intense action employed as a plot device, as opposed to an entertainment feature of the film, and a superficial, underdeveloped but fundamental to the story backdrop of human emotion. 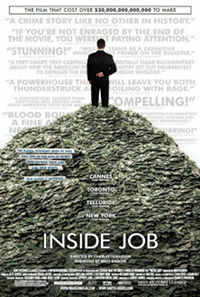 This movie is a brilliantly engineered hollywood blockbuster, rather than a cinematic masterpiece. Great entertainment, it ultimately lacks the originality, the depth, the masterful storytelling that would propel it to levels beyond those of a blockbuster; Action, emotion and scientific/philosophical components are amply sprinkled in support of an average story aimed to satisfy almost everyone watching it. For those accustomed to brainless Hollywood films, Inception may seem brilliantly nuanced and complex. On the contrary, those trapped within the cinephile, high-brow notions of classic european films, will probably find the marriage of uncelebrated action to a deeper, more complex and, above all, ’emotional’ setting acceptably thrilling. In the end Inception is a film designed to be liked by the majority of its audience; and that is perhaps its greatest flaw, for it could have been a rare example of great contemporary cinema instead of a polished blockbuster for the masses.